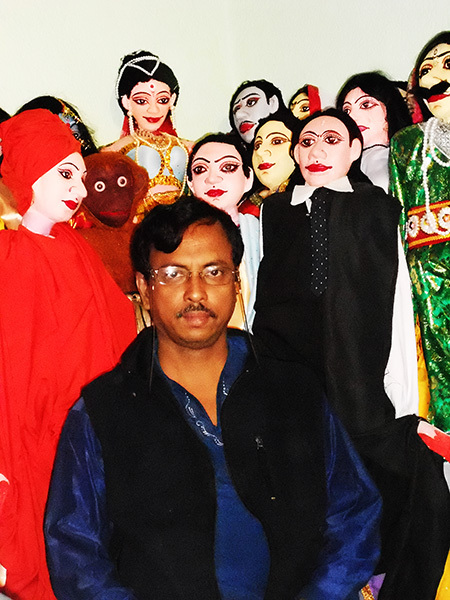 Puppeteer Nirapada Mondal is the present head of Satya Narayan Putul Natya Sanstha, a puppet group founded by his grandfather, the late Kangal Chandra Mondal more than 30 years ago. When he took over the reins from his father, Haromoni Mondal, the popularity of the form was already severely eroded. Nirapada began implementing new ideas into the traditional Danger Putul, in order to win back some of the popularity that had been lost to modern forms of entertainment that had begun to overwhelm rural Bengal since the 1980s. To gain more skills, Nirapada broadened his exposure to contemporary puppetry by attending puppetry workshops. He worked under the guidance of Padmashree Suresh Dutta, Director of Calcutta Puppet Theatre to further develop his puppetry skills and technical expertise. He also experimented with papier mache and began to use this lighter puppet instead of the heavier traditional wooden puppet. 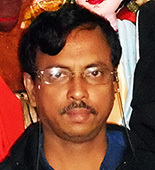 Nirapada was awarded a National Scholarship in 1997 from the Government of India. Nirapada`s successful productions include Raja Harish Chandra, Mukti Chai, Natun Jivan, Siraj-Ud-Doula and Raj Laxmi. He has participated in numerous programmes in India and has also performed at Nepal, Pakistan, Laos, Indonesia and Myanmar. Though there is no doubt that Nirapada has helped rod puppetry regain some of its popularity, with the help of modern science and technology, there is a greater impetus needed to be given for this traditional form to come out of the doldrums.